The Boston Police Department Wishes Officer Karen Tognarelli a Happy Retirement! Today, Commissioner Evans attended the last roll call of Police Officer Karen Tognarelli, who just retired this week. 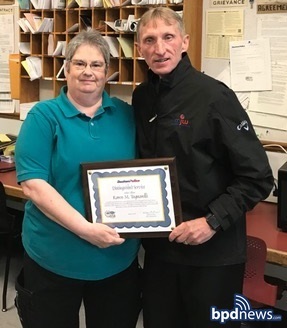 Officer Tognarelli has worked for the Boston Police Department for almost thirty-one years and has been a fixture at District C-6 (South Boston) and around the Southie neighborhood for nearly twenty-two of those years. From all of us at the Boston Police Department, we say, "You will be missed, and enjoy your retirement!"